The FatCat..ooops BigCat from down south has put on record something a big majority of road users experienced over the weekend. 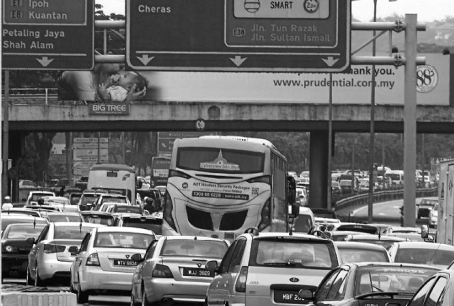 1.Too many cars on our roads and highways at the same time. The traffic congestion was not only confined to the highways as the trunk routes were as bad, if not worse. 2. Irresponsible drivers/road users who break every possible traffic law and defy common sense while on the road ... from road hogging, parking indiscriminately and ... basically driving like morons on holiday. 3. Poor service of highways operators (i.e. sickening or rather lack of traffic management/booth at toll plaza), particularly PLUS and the other operator of the East Coast highway. Was caught in the horrible traffic jam at the highway on my way back to KL after the long weekend yesterday. What was supposed to be a three and a half hour drive lasted almost nine hours. That was continuous driving except for a single pit stop for fuel. Building new highways or widening the existing ones would be 'mega projects' that would be yelled at on the streets and shot down by our holier than thou politicians. For some mega projects = waste of rakyats money. Introducing a tested high-tech surveillance and enforcement mechanism like the AES on our roads is made to appear like a sin. So, what else do we do apart from getting PLUS and gang to practice their CSR where and when it really matters? 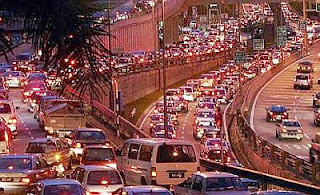 Could abolishing taxes on cars, as suggested by another bunch of intelligent politicians, solve this traffic problem of ours? p/s Thank god Mat Sabu is not Transport Minister. Mana High Speed Rail project? Why the delay? Just build one running along all the toll highways from N to S and E to W and besok guarenti jam semua hilang. 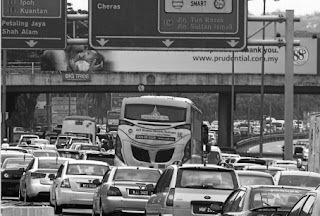 But there again the mentality of Malaysians, almost every one has a car, maybe becoz the bus and train services are not good..but plan your timing and journey. By the way, I face this every Fridays going down south and Sundays coming back to the city. Jangan lah macam ni pun nak blame politicians!!! Yesterday I was driving from Kuantan to Putrajaya. I left from Kuantan about 10.45am. In the hot noon near exit Lancang. suddenly the cars in front slowing and then stopping, moving very slow, then stop again. Repeatedly until you see signed of toll Karak about 12km away. how about selling lemang by the edge of road where it is already cordoned off for mrt? why no action by authorities? Is BigCat anything like BigDog? I don't want to ask her lah. She may be in denial, so I'm asking Apanama.